This weekend we are headed to Albuquerque for the International Balloon Festival, it is the largest in the world with close to a million people attending (maybe it will be a million this year!). We could not be more excited as it is something that Mr. Misadventures has wanted to photograph for a long time, plus, it’s right in our own backyard! 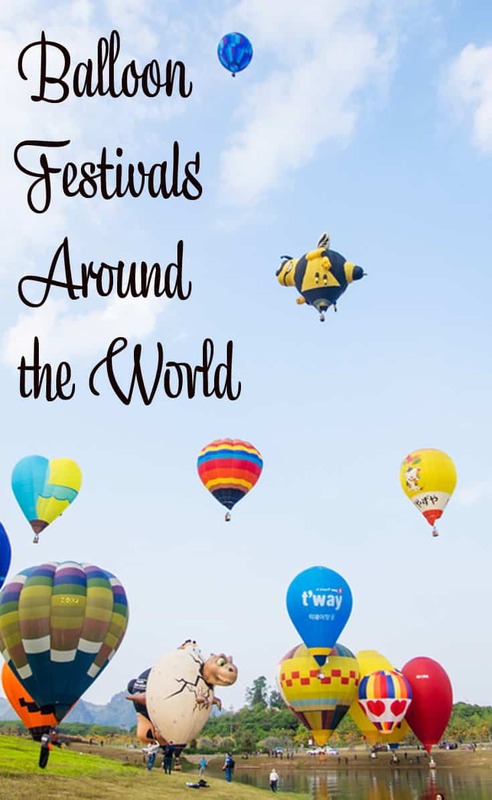 To get you prepped for balloonapalooza I thought it would be fun to hear about other balloon festivals around the world and I found plenty of travel bloggers who have attended these wonderful events and were happy to share their experiences. When you think of hot air balloon festivals in USA, the first thing that comes to mind is, probably, Albuquerque, NM. But there are many smaller balloon festivals all around the country. I was lucky to visit Hot Air Balloon Rally in Pittsfield, New Hampshire, organized by Suncook Valley Rotary Club. The rally has been conducted for the past 36 years as the means to raise funds for service projects in the surrounding areas. During three days in the beginning of August you can see the launch of hot air balloons twice a day: at 5.30 AM and 5.30 PM. Talking from personal experience, the morning launch is especially magical. Watching balloons raise in the sky along with sun is a one of a kind experience. After the morning launch you can have a hot breakfast of pancakes or scrambled eggs cooked right in front of you in the field. 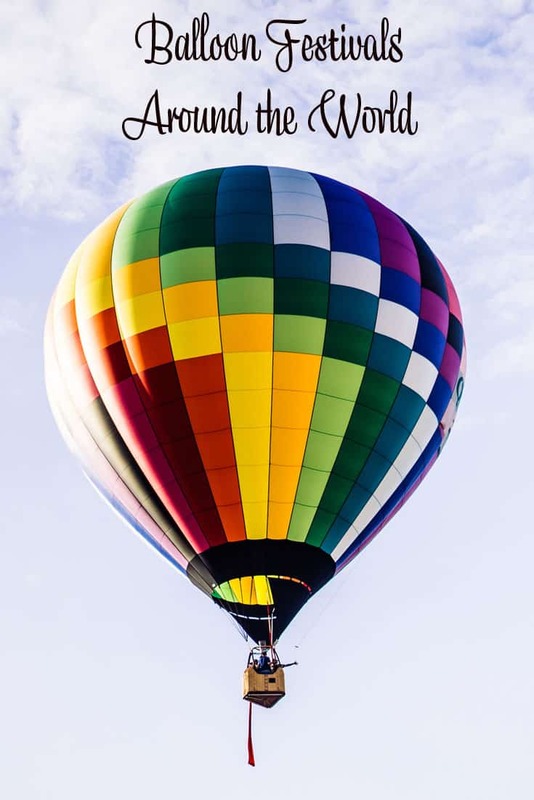 Unfortunately, rides in hot air balloons are not available during this rally, but you can enjoy a tethered ride, which means that the air balloon is securely anchored to the ground, but can ascend a certain height. The rally also features many carnival rides, amusement attractions, helicopter rides, and delicious food from local businesses. 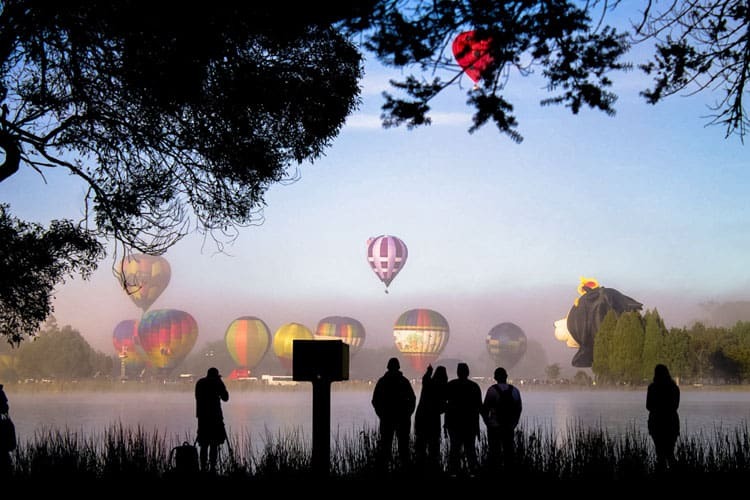 The Canberra Balloon Spectacular is one of the most popular hot air ballooning events in the world. Canberra is the capital city of Australia and is quite different to both Sydney and Melbourne. It is located between these two top-rated cities and was purpose built on a sheep farm. Canberra as the home of the government of Australia is quite innovative with their arts, food and culture scene. Not only do they host the most successful flower festival in Australia, Floriade, but they have the Canberra Balloon Spectacular. For some reason, this inland city is ideal for hot air balloons. The festival has become so popular that it now runs over nine days in March each year. To add some irony to the event, considering that Canberra is the political capital of Australia, the balloons launch from the lawns of Old Parliament House. 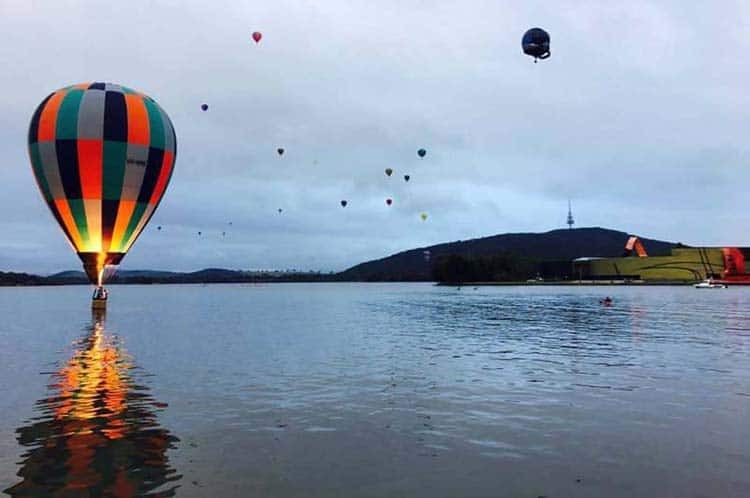 Simultaneously at 6.15am each day during the festival the hot air balloon and over Lake Burley Griffin. The Canberra Balloon Spectacular Festival has become so popular that often there are some quite controversial balloons, like Skywhale which was created for Canberra’s 2013 centenary. Regardless, the skies over Canberra are awash with stunning and often controversial hot air balloons during this Canberra Balloon Spectacular Festival, and it is one of the most amazing, and yes spectacular sites. The stunning scenery and friendly locals make New Zealand the perfect location for my favourite balloon festival. The city of Hamilton is the stage for Balloons Over Waikato, New Zealand’s foremost hot air balloon festival. Held each March, visitors gather from around the country and the world to attend the 5-day event. Each morning the day is greeted with the launch of dozens of hot air balloons over the city. Balloons start their journey on the banks of the Hamilton Lake. The soft glow of the sunrise reflecting the colours and shapes of the balloons onto the still lake is enchanting. Whimsical cartoon characters float alongside traditional teardrop balloons with their wicker baskets. Bold colours pop against the clear blue of the New Zealand autumn sky. The pinnacle of the event is the Zuru Nightglow. This family-friendly, free event kicks off with a concert featuring local and international artists. When the sky has darkened the Balloons are launched to a choreographed music and light show. The warm flames of the balloons glow across the Hamilton skyline as the concert continues into the night. March is a great time to visit New Zealand, summer weather still lingers but the holiday crowds have dispersed. Hamilton is only an hour drive or train from Auckland, New Zealand’s largest city and airport. Are you planning a visit to France? Interested in exploring the lesser known area of the Lot in South West France? Well, here’s just another reason for you to put this region on your itinerary! 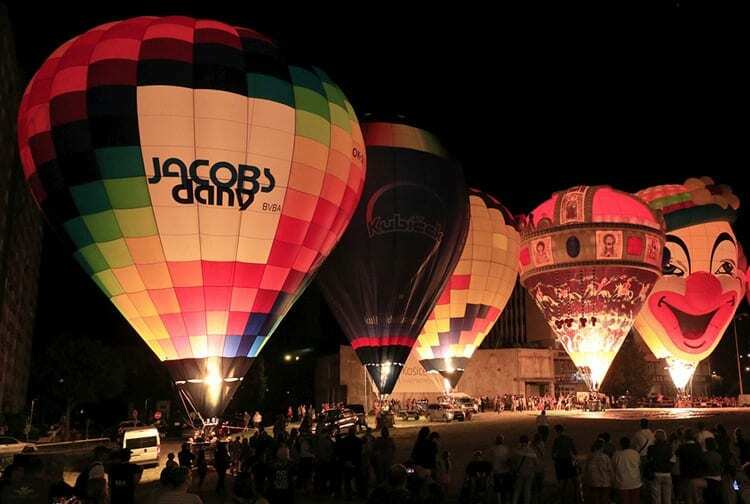 Every year, during the last week-end of September, Rocamadour plays host to the annual Les Montgolfiades Hot Air Balloon Festival. This beautiful village provides a most unique and stunning backdrop to the Festival. Its chateau perches high above the deep gorge while the rest of the village hugs the cliff side. In true French style there is also a large brocante on the Sunday. 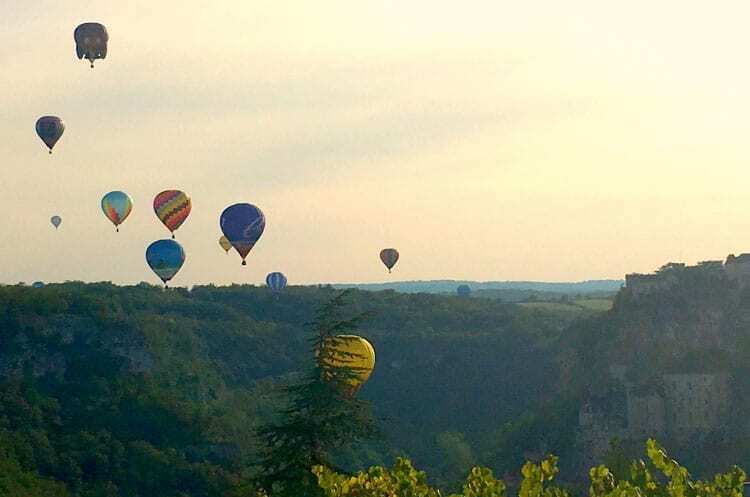 Rocamadour is not only a UNESCO World Heritage site but also an important pilgrimage destination and worth a visit at any time of year, but it’s especially worth the detour for Les Montgolfiades. The Festival Internacional de Balões de Ar-Quente (International Festival of Hot Air Balloons) takes place every November in Portugal’s Alentejo region. 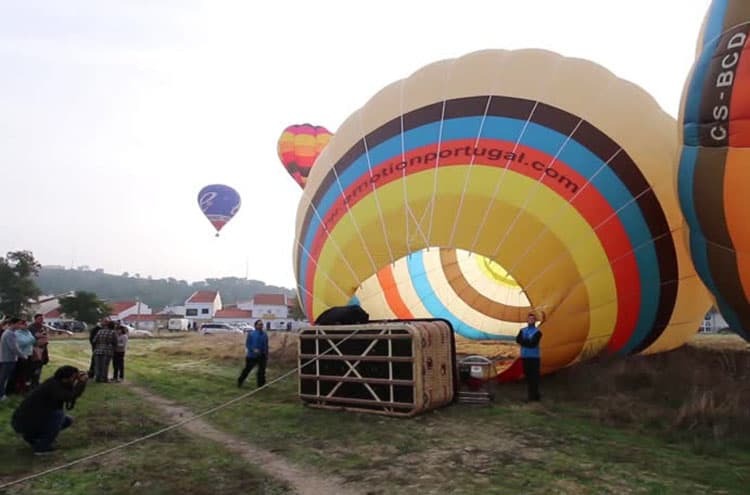 The event is organised by Publibalão and Alentejo without borders-balloon Club and attracts teams from all over the world, including Spain, France, Belgium, the UK, Holland, and Germany. Over the past few years between 35 and 50 different teams have taken part – the financial crisis did reduce the numbers for a few years, but it looks like they are steadily increasing again. The Alentejo is a region of Portugal that many visitors overlook in favour of other regions and cities like the Algarve, Lisbon, and Porto, but it’s a region that has a lot to offer including beautiful scenery, great wine, and great regional dishes. November is also a fantastic time to visit as the weather is much cooler than the summer months when it frequently tops 40 °C. If you’ve ever wanted to take a hot air balloon ride, this is when you should do it: free hot air balloon rides are available during the festival, usually in the morning. It’ll give you a chance to see the Alentejo from two perspectives: the ground and the air. Betanzos is a mid-size Galician municipality in the province of A Coruña, Spain. During the San Roque festivities, a large paper balloon built by the community and filled with diverse messages is launched at the main square every August, 16th at midnight along with an expressive applause and the ringing of the town bells until the balloon gets lost in the night sky. The tradition has been going on for over two centuries since the first elevation of an aerostatic balloon in honor of King Fernando VII took place on May, 29th 1814. These days over fifty thousand people gather in Betanzos main square every year to celebrate this commemoration and release a new balloon. It is said that it is one of the largest in the world and this festival makes for the perfect time to pay a visit to this historic villa. Other than that, Betanzos is a quiet spot in the North West part of Spain and has a very well preserved old town that comes from the middle ages. The church of our lady of the Camino (Santiago’s Way), the old bridge, the Garcia Naviera brothers’ square, Santo Domingo’s convent, the square of Fernan Perez of Andrade, the local park and the church of Santiago are well worth the visit! For other Galicia must-see places, check out this post. During our stay in Switzerland, we had this opportunity to visit the grand balloon festival held in the village of Chateau d’Oex near Montreux. This balloon festival is one of the popular festivals of Switzerland and has won Chateau d’Oex the title of the ‘Hot Air Balloon Capital’. The annual Balloon Festival held in the month of January draws pilots from all over the world. 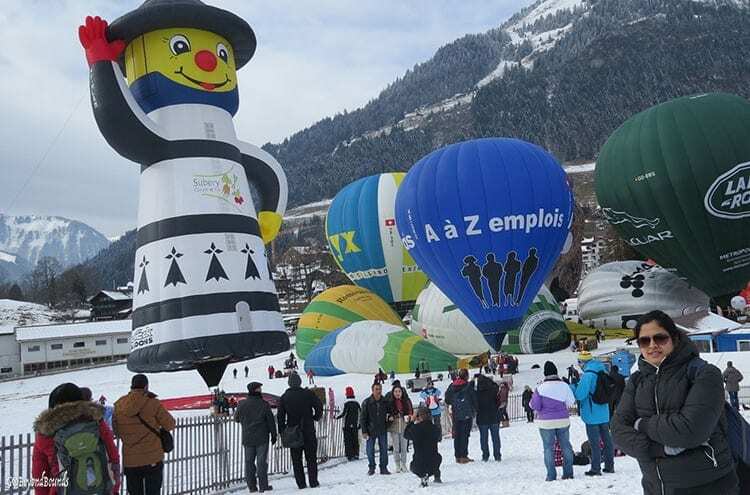 The fest puts up a spectacular show of balloons in all colors, shapes, and sizes over the snowed landscapes of the Alps. Make sure to stay until dusk when the ‘Night Glow’ happens, the balloons lit with golden light adorn the starry sky is a mesmerizing show to behold. When you are here for the festival make sure to visit the small village of Château d’Oex, one of the beautiful Swiss villages with its pretty chalets. There is also a Balloon Museum housed in the Town Hall of the village which exhibits artifacts and information on the history of hot air ballooning. How to get to the festival: The village of Château d’Oex is around 50 minutes bus ride from the town of Montreux. Montreux is an hour train ride away from Geneva and the Swiss capital Bern. Balloon Fiesta Košice will quietly celebrate its 25th anniversary in 2018. The country’s only hot-air balloon festival is a summer highlight in the biggest city in eastern Slovakia (and my hometown). Some two dozen balloons, launched in early morning and evening flights by crews from Slovakia, Czech Republic, Hungary, Romania, Holland, Belgium, and other countries dot the skies with a colorful spectacle for several days. 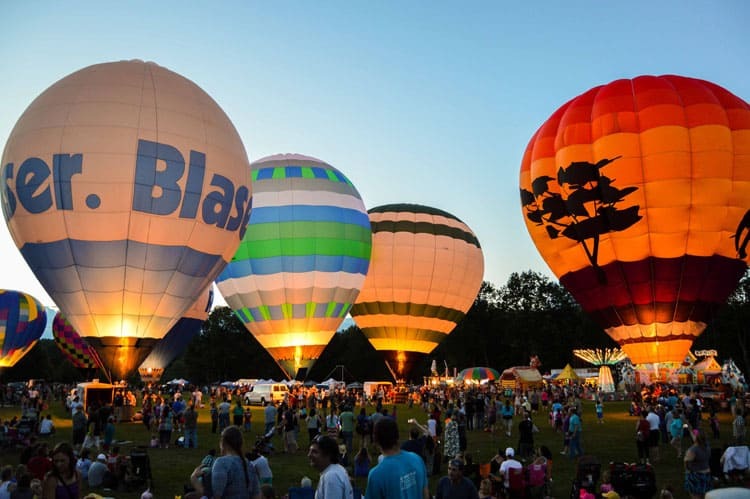 Additional events complement the main show: nighttime inflating of balloons, folklore music performances, fireworks, activities for kids… It’s a true fiesta! Hopes for favorable winds expressed in media previews of the June event have an all-too-real dimension. The biggest challenge is the (in)famous Košice wind, blowing through the valley from the north. In 2015, for example, strong wind gusts marred the daily balloon launches. Tickets for flights during the festival are available for purchase a month ahead of time. From above, you can catch amazing panoramic views of the historic downtown, suburbs sprawled over rolling hills surrounding the city, and, on exceptionally clear days, also the High Tatra Mountains 125 kilometers away to the northwest. It’s sunrise. The silence of the flight is punctuated only by the occasional blast of the powerful burners, while you let your view gaze over the Magalies River Valley in the Cradle of Humankind World Heritage site, or the Magaliesberg range in South Africa, not more than 45 km north of Johannesburg’s northern suburbs. You can hear the faint call of birds or other animals far beneath while hovering gently but majestically above the treetops. 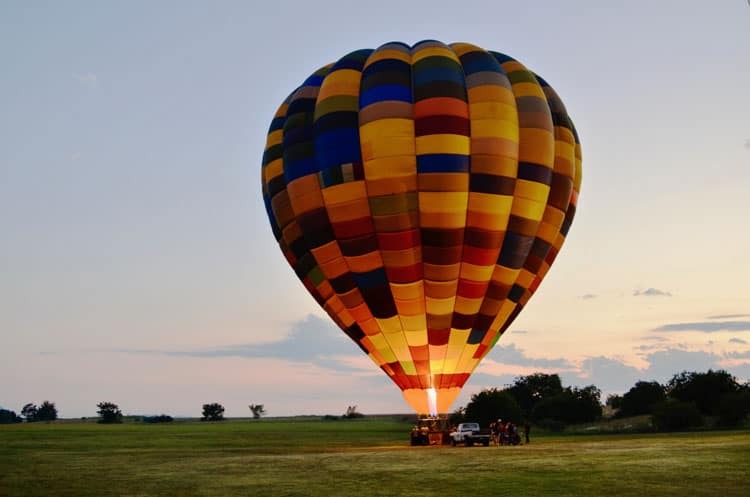 In South Africa, hot air balloons were originally used by the military for reconnaissance purposes. Nowadays is an activity for everyone and any occasion, especially the ones where there is champagne involved. Somehow or other, it is an fabulous experience that you will never forget. Hot air ballooning in South Africa has even been celebrated as a festival in the year 2015 as Hot Air Balloon Festival in Bethlehem. Rumor has it that this event might be repeated in the future. But there is more than that: an organization called BAFSA (Balloon and Airship Federation of South Africa) organizes the annual South African Hot Air Balloon Championships. Read about more things to do in Clemen’s South Africa Guide. The PIHABF is celebrated every 2nd week of February at the Clark Freeport Zone in Pampanga, Philippines. The festival has been running for 21 years already. This longest-running sports and aviation festivity isn’t just a weekend of hot air balloons. 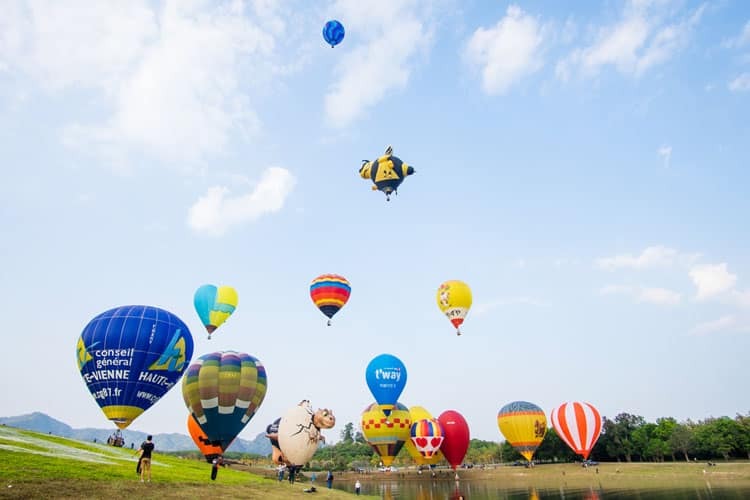 There will also be days of flying activities including hot air ballooning, skydiving, aerobatic exhibitions, paragliding, aviation formation, search and rescue flight demos, and balloon bursting, among other aviation spectacles—await attendees and participants to the highly anticipated event. It could also be a romantic spot for couples during Valentines Day. Many attendees are getting engaged every year during the festivities including celebrities and famous people. A perfect time to propose! Held around Valentines Day ever year, the Singha Park Hot Air Balloon Fiesta is a magical sight to behold. Pilots from more than 17 countries take to the skies in dozens of balloons throughout the four day festival taking part in competitions, night flights and scenic flights. The balloons themselves are a work of art, whether you are a fan of the traditional rounded shape, or enjoy the fun character balloons – there’s nothing like seeing a giant ‘angry birds’ balloon floating across the sky! – and you could spend hours watching and photographing them! What about you? Do you have a hot air balloon festival to recommend? Have you been to any listed above? Do share! This is such a huge bucket list item for me and has been since I was a little girl! I always see articles and ig post about these especially in Turkey. I will have to refer back to this when I am finally ready to see this! This looks awesome! When I was a kid, I went to a hot air balloon festival and it is one of my favorite memories. I wish we had one by me that I could take my kids to. They are spectacular to watch!! I’ve never been to an event like this but I need to go. Those photos are beautiful and the balloons are so colorful! Being afraid of heights will keep me on the ground that just being on the ground watching them would be an awesome experience. Magical air balloons in the sky.! I love watching hot air balloons fly through the sky. It would be so fun to travel the world taking in all of the balloon festivals. 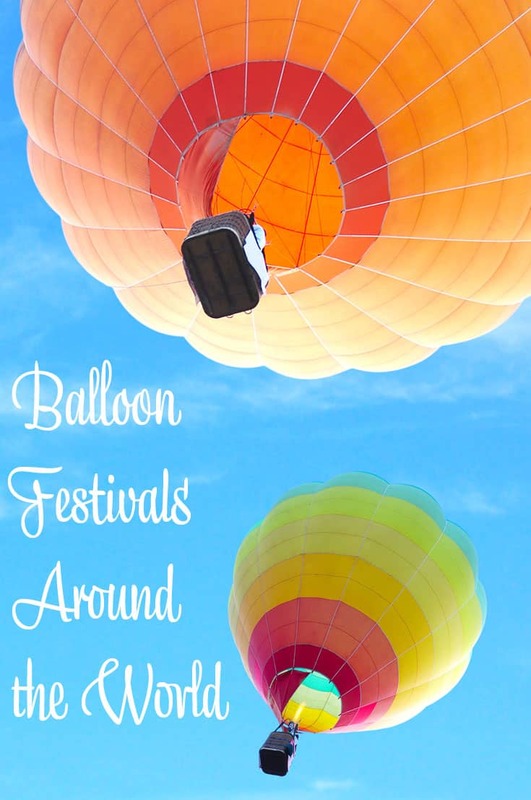 So many great balloon festivals to choose from! I particularly love the history and tradition surrounding the one in Galicia, Spain. I look forward to reading all about the one in Albuquerque that you’ll be visiting, it also sounds amazing! These festivals look like so much fun. My husband always went to one in New Mexico growing up. We have it on our wish list for a family travel plan but it has not worked out yet. Hopefully one day. I think my kids would love going to a festival like this. First of all, these pics are absolutely beautiful. I’ve always wanted to take a hot air balloon ride. But, my phobia of heights kind of make it extremely difficult. It looks like tons of fun though, thanks so much for sharing this! I’m going to the Albuquerque Balloon Festival too this year – so excited! I think I might check out the one in NZ too – I’ll be home in Auckland in March and I have a friend in Hamilton. Oh my goodness! I never realized that there were so many balloon festivals around the world! The photos are truly spectacular and I like that the Canberra Balloons launch from front of the Old Parliament House. It would be fun to travel to all of these festivals. Maybe a few every year? I love hot air balloons! It is such an amazing sight to see. All those beautiful balloons rising up and floating off! we would take our kids when they were younger and they loved it! Lots of fun! Going to at least one hot air balloon festival is on my bucket list. They sound like so much fun and seeing all the different hot air balloon designs would be so interesting. Love looking through your pictures. They are really pretty. I would love to add all fo these to my bucket list one day. I’ve been to South Africa and had no idea about the balloon festival there! I have to say that the TOP one on my list is Cappadocia! I would love to visit when this is going on! I’m going to Santa Fe next month for the first time. I LOVE the ABQ Balloon Fiesta! I used to go every year when I was younger, I really need to go back. Maybe Next year. Have so much fun! It sounds crazy but I have never seen many hot air balloons gathered together! This is an incredible list, I am visiting Portugal in November! Might be lucky enough to see the balloon festival in alentejo! Thanks for the list! I didn’t know there were so many around the world. I lived in Albuquerque and got to crew and ride in several balloons. Ohh wow, It really looks that you had an awesome day there and I love to see Hot air balloons in person and I know it’s fun my daughter would surely love this too for sure. Wow! I’ve never even seen a hot air balloon in real life, let alone an entire festival! It’s great to see that Philippines is on this list! Yay! I love the idea behind the large balloons in Spain. Actually, I love all of this! Never been to a hot hair baloon festival nor on one, but now is on my wish list! I’d have never thought there were so many and spread all over the world, this is insane! The ones in Europe seem pretty interesting, but is the one in South Africa that makes me what to leave right now! That looks like such fun. 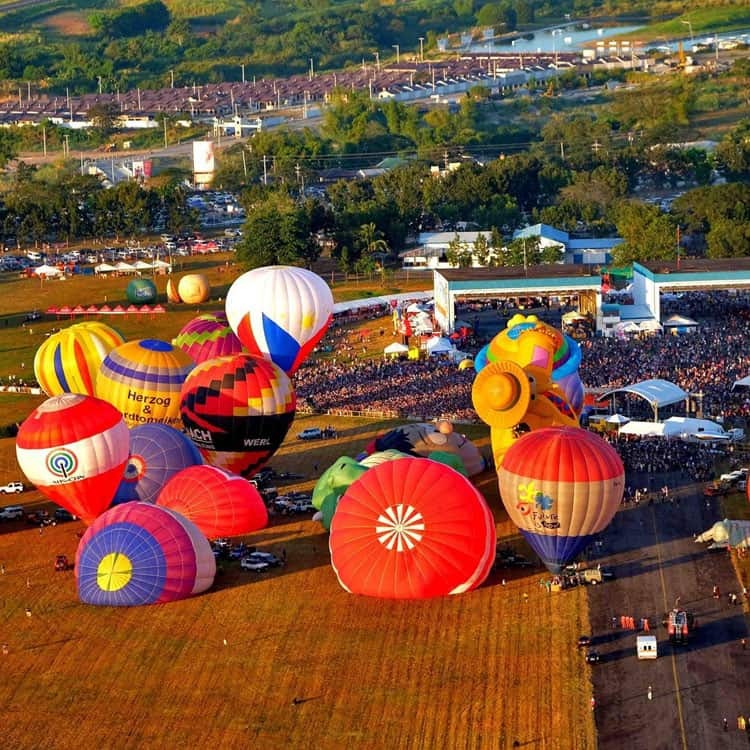 About ten years ago I went to a balloon festival in South Dakota and it was absolutely amazing. I wish I could find one nearby to take the kids to, they would love it. Wow, going around the world to every balloon festival is going on my bucket list right now. I love all of these! My town used to have a mini version of a balloon festival…launching up to 20. The field they used ended up getting too small due to trees growing in. They still have it but only launch one now. Not as grand but still cool to see. I’ve always wanted to go to a balloon festival, not so much riding in one but they look beautiful. I would love to go to a baloon festifal! Looks like so much fun.. Thank you for nice photos. I have seen these in Albuquerque, New Mexico, They are truly a sight to behold. Ballooning looks like a lot of fun, ive always waned to do it. Looks like a lot of fun and the balloons are beautiful!